Should the U.S. Drinking Age Remain at 21? Within the vast majority of societies spread throughout the world, people who are 18 years old are considered adults and can be held responsible for living on his own, holding dangerous jobs, enlisting or volunteering to fight for his country, and potentially being prosecuted for criminal offences. This brings forward the debate in the United States if the legal drinking age should remain at age 21. If we, as an American society recognize 18 year olds as adults who can hold such responsibilities and who are capable of such decisions within our society, why do we restrict their choice to drink alcohol? According to an article by ABC, “Alcoholism is a brain disease and the earlier people start drinking, the worse the effects on the brain. Besides, research has shown that the earlier people start drinking, the more likely they are to develop alcohol problems later in life" (Jacinto, 2016). Just because we recognize 18 years of age to be an adult responsible age, it doesn’t mean these 18 year olds are fully mature enough to make such decisions in regards to alcohol. Society will continue to stand strong protecting 18 year olds from alcohol intake. According to many medical studies, the human brain does not fully mature until the age of 25. This shows that the legal age of drinking should not be lowered to age 18 based only on the fact that medically, the brain has not matured enough to make such mature decisions. According to the University of Rochester Medical Center, “In teen's brains, the connections between the emotional part of the brain and the decision-making center are still developing. Adults think with the prefrontal cortex, the brain's rational part. This is the part of the bran that responds to situations with good judgment and an awareness of long-term consequences. Teens process information with the emotional part” (Holloway, 2016). Now, one may argue that 18 is close to 25 so hasn’t the teenager matured enough to decide if he wants to drink or not just like he can decide if he wants to join the military or not? Or one might bring up the fact that even 21 year olds should have to wait until they are 25 years old to make any decisions within society if that is when their brain matures. Laura Dean-Mooney has studied such topics and found that because many just aren’t waiting until they are 25 years old to make such decisions, 21 year olds have enough mental capacity to do so, she found that “more than 50 high-quality scientific studies all found the 21 law saves lives, both on and off the road. And the public agrees: 72 percent of adults think that lowering the drinking age would make alcohol more accessible to kids, and nearly half think that it would increase binge drinking among teens” (Dean-Mooney, 2008). Put frankly the problem isn’t maturity, the fact is that teenagers get drunk twice as fast as adults but even more trouble is knowing when to stop drinking. When looking at the laws keeping the legal drinking age at 21, it is to keep themselves safe and also society safe helping them make rational choices. Alcohol has proven to cause people to engage in risky behavior. The inhibitions hypothesis states that when people drink their inhibitions to do good go away. Because of emotional choices that teenagers make consuming alcohol would create a lack of inhibition causing them to make more bad and unstable emotional choices. Loyalty and prevalence rates would remain lower according to studies done by Laura Dean-Mooney if the alcohol legal age remains at 21 years of age. “More than 3000 teenagers die every year in drunk driving accidents. Further, the rate of alcohol-related automobile accidents is higher for drivers between the ages of 16-20 than it is for adults over the age of 21. The rate is higher for teenagers because teenagers are generally inexperienced with alcohol, they take greater risks, and they exercise less caution.” (Free Advice Legal, 2016). Not only is the lack of inhibition a worry for society but the bad judgement of driving while under the influence of alcohol puts others in danger as well. Teenagers are well aware of the warnings society has given them about drinking and driving but it hasn’t prevented them from doing so. Keeping all safe on the roads is an upmost concern for all. Keeping the legal drinking age at 21 will do exactly that. Keeping the drinking age at 21 not only helps save lives but it does this because there is more time to show young people the risks of drinking alcohol. NYC times summed this up perfectly by stating, “If the perception of risk is increased, then drinking quantity and frequency may decrease” (Zapolski, 2015). If society were to lower the legal drinking age then there would be a higher prevalence rate due to less risk of drinking alcohol illegally. There would also be a decrease in acute effects of alcohol such as slower motor skills and lack of coordination which would affect things such as driving while intoxicated. Keeping the age at 21 could show teenagers the risks they are in when drinking and also show society when waiting until the age of 21, there are so many more benefits to not only the drinker’s safety, but others safety as well. In conclusion, it is vital for us to focus on the overall health and safety of society rather than meeting an immediate immature needs of a teenager when considering the legal drinking age. Due to youths making emotional choices as well as the brain not fully developing until age 25 it makes it difficult enough for 18 year olds to already make important decisions in life. They don’t need to make it harder by the clouding effects of alcohol. Keeping the age at 21 will help keep others safe as well as the young drinkers. Holloway, Beth. 2016. “Understanding the Teen Brain.” Health Encyclopedia. Retrieved December 4, 2016 (https://www.urmc.rochester.edu/encyclopedia/content.aspx?ContentTypeID=1&ContentID=3051). Jacinto, Leela. 2016. 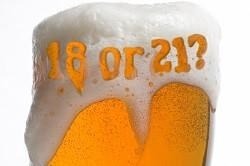 “Should Drinking Age Stay at 21?” ABC News. Retrieved December 4, 2016 (http://abcnews.go.com/Politics/reince-priebus-dismisses-controversy-sessions-confirmed/story?id=43660712). Zapolski, Tamika. 2015. “Keep the Drinking Age High - NYTimes.com.” Keep the Drinking Age High. Retrieved December 4, 2016 (http://www.nytimes.com/roomfordebate/2015/02/10/you-must-be-21-to-drink/keep-the-drinking-age-high).